Now that we’ve gotten past the FAQ on moving to Germany, we better just dive right into the juicy bits and pieces of moving to Hohenfels. While needing to know about passports, what appliances to bring and what clothes you should pack are all necessary, I know that you are aching to figure out the fine print and details to your actual new duty station. So here are a few USAG Hohenfels Resources as well as FAQs to help you out before and during your PCS to Hohenfels. I know, I know, you want to get all your ducks in a row. The first thing you want to know is “Where will we be living! ?” or “I am (insert rank), what kind of housing can I expect? ?” Not only is this an exciting part of moving, it can actually be completely logistical. You want to start looking at housing areas online, figuring out floor plans so that you can start organizing furniture, doing your standard PCS Purge and you are just curious and ready to have that part of the move taken care of. Unfortunately, that’s not really how it works for housing in Hohenfels. Depending on the time of year you arrive, if you are coming in high PCS season (typically the summer), you can expect as long as two months for housing to become available, which makes it frustrating that you can’t plan it out before hand. However, there are so many great housing options that it really, truly does work out in your favor to have to wait until you arrive so that you can see them all in person and get to choose what will work best for you. On Post Hotel: Most likely, when you arrive, you’ll stay on Post at the Sunrise Lodge. Reserve early for PCSing (as in, as soon as you get your official orders), especially if you have a pet. Apartments (Ranges 2-4 bedrooms): Typically known as “Stairwell” housing. One set of apartments is located behind the PX which gives great walking access to shopping as well as the school and other nearby important buildings. The other apartments are behind the Sunrise Lodge, still on the main drag of Post, so still very walk-able to the PX, school, clinic and more. Even as apartments, these are no teeny tiny spaces. But, considering it is still apartment living, things like extra storage may be more limited than other options. Townhouses/ Duplex Style: These 3-4 bedroom homes are quite large and spacious and are usually able to fit your typical family room setup as well as a dining set. While an oversized bedroom set may be a tight squeeze, you are safe with average sized dressers and queen sized beds. Some people don’t like living on Post, but there are plenty of pros to these living quarters! In this neighborhood on Post, you get a fenced backyard, THREE sheds for plenty of outside storage of items, a neighborhood playground AND you are within short walking distance to the commissary! Due to limited on-Post housing options, many Americans find themselves off post. Most families come to really enjoy this. Throughout many surrounding villages, there are small neighborhoods that have American/ Government leased housing. These homes are operated by the Army, meaning if there are any issues, you go through the housing department on Post, such as repairs. The pro to this is that you can work directly with someone who speaks English well, you don’t have to worry about German banking (your housing allowance just goes straight back to the Army), utilities are covered and you know your lease is good and valid. The cons are that the housing department isn’t exactly known for their timeliness on matters and that it can often take a long time for a spot to open up! So, you win some-you lose some! These homes are often a duplex style homes that typically have both 110v and 220v voltages in electricity. Many of these homes are huge! Some are as big as four floors, 3 bedrooms, several bathrooms and tons of extra storage space (often as big as bedrooms themselves)- perfect for man caves or toy rooms! Depending on the specific housing neighborhood, some of these homes have fenced in yards and garages, while others will have designated parking and open yards. With private housing, you’ll find the whole gamet of houses from small apartments to ginormous, beautiful homes, all depending on your budget and personal preferences. Of course with private rentals, you will be taking care of your own rent (using your Housing and possibly even COLA (adjusted for cost of living) expenses), will have to set up a German bank account to pay rent out of, you’ll have to find your own internet providers, will pay for utilities and you will deal with your (German) landlord for issues that may arise. You can still use the Housing Office though for assistance in finding homes, if major issues arise with landlords and for drawing up leases. While this seems daunting, with the help of a friend who has done it, it’s super simple to set up accounts and live like a local, which is often rewarding and can make your experience abroad even more memorable. Note: If you are a contractor, you are not allowed to use the Housing Department and unfortuntalely, many landlords only want to work with Americans that can go through the Housing Department. It can become a long and frustrating process. Talk to your HR department about what resources they have to assist you and quickly befriend a colleague that can also help walk you through the process. You could end up in just about any of the endless quaint villages dotting the countryside surrounding Hohenfels, but here are some of the top picks of locations where Americans like to call home for their PCS. Parsberg: This is our personal favorite, but I’m a bit biased considering we’ve lived there for almost 6 years! You’ll find several grocery stores, plenty of restaurants and a main train station all within walking distance. And considering that one of the best Doner stands can be found here, I think you know my real reason for staying in Parsberg! Approximately 15 minutes from post. Government leased and private rentals both available. Our “hometown” in Germany: Beautiful Parsberg! Lupberg: Right next to Parsberg (2 minute drive), this tiny little town is perfect for feeling like you are in the country but close enough to Parsberg for every day amenities and transportation. Both Private and Government leased homes and duplexes are offered; all extremely large and perfect for families. Beratzhausen: While not AS many amenities as Parsberg, you’ll still find plenty in Beratzhausen such a grocery store, several places to eat and another train station (albeit, up a decent hill to “hike” up to). Approximately 15 minutes from Post and government leased as well as private rentals both available. Hohenfels Village: A variety of homes are found in the actual German town (off-Post) of Hohenfels from government to private rentals. Most people that live in Hohenfels appreciate the close commute (approximately 3-5 minutes) to Post. If you’d rather use the Commissary and other US amenities but want to be in a German community, Hohenfels is a good option! Schmidmulen: This German town is right outside the “Schmidmulen Gate” of Post, but you have to drive through “The Box” or, the training area, to the main post, so plan on at least 10-15 minutes to get to main post. While not too much is in Schmidmulen, you’ll find a few Gasthaus, a grocery store and a beautiful, quaint, colorful German town. Hohenburg: About 15-20 minutes to post, there are several government neighborhoods throughout Hohenburg. Just like in Grossbissendorf, this is a wonderful community for people who want the support of American neighbors but not ideal for those wanting to live a little more “on their own.” Most people that live here find themselves grocery shopping in Schmidmulen or on Post and you won’t find too many places to eat. However, the size of the homes often over compensate for the lack of nearby amenities! Can you get any more gorgeous than Kalmunz, a village just minutes from Post? Regensburg: Closest big city to Hohenfels and a favorite for everyone to go to, even just for the day. Has tons to do including nightlife, cafes, any kind of restaurant you could be craving, gorgeous historical buildings and is perfect for those wanting to be truly enveloped by a German town, life and culture. No matter where you end up living, it is like anything else with a move to Germany. Go into it with an open heart and mind and be ready to fall in love with your new location. If you would like to have one less thing to do when you arrive to Hohenfels, you can register at the school before arriving. If your child will be playing any sports or will be attending any form of childcare on post, all immunizations are required to be up to date (religious exemptions are not accepted). A physical AT Hohenfels will also need to be done before starting any sports. Most of the housing areas are serviced with buses to and from the school. If you are going to be living in a private rental, please check with the transportation office as to the nearest bus stop. Note: German driving laws are different from those in the US. PLEASE take the time to talk to your children about bus safety. For example, drivers are not required to stop for a school bus and traffic will not stop. Some families choose to send their children to off-post, German schooling. Pros: They get immersed in the German culture! Cons: If they are not young and have no German language skills, this is a very difficult assimilation. Many people also say that the education systems are quite different and that some kiddos struggle to transition back to a US school when the time comes. Kindergarten: Kindergarten is what Americans think more of “Pre-School” but kiddos as young as 3 can start going. Grundshule: “Basic School” is the German equivalent to elementary school. Unless you intend on staying in Germany or you are a German yourself, while the idea of sending your kids to Grundhule sounds intriguing, it can be a tough transition. Drop In: If you are wanting a day care plan where you can drop the babes off for a few hours here and there to run to the gym, pop into the commissary and finish your errands, don’t hold your breath. Drop in at the CDC on Post is used more for families that have occassional doctors appointments and the such. Ask for anything even semi-regular and they’ll ask you to jump all the way up to full time. SAC: The school age program is where kiddos needing childcare before or after school due to parent work schedules go. 1) Spouses are primarily seen as secondary to the soldier. AKA: You are only there because of your spouse, not to find a stellar career. Now, this isn’t entirely wrong, but it is nice to feel appreciated for your skills and services once in awhile! 3) The system knows that spouses are desperate for work…and they use that to their advantage. You may be the most qualified person in Bavaria for a job, but because they know that they have 10 other applicants willing to take the job for less, they are going to offer you less. 4) Openings aren’t common. Despite such high turn around of people moving in and out of Hohenfels, finding a job opening can be tough. They often will post a job because they have to, but may already have someone internally in mind to move into that open slot. Also, there are rules about needing to have a certain ratio of German locals hired, so it’s possible that a position that you would be highly qualified for won’t ever even open up to an American. Now, the above is not a hard and fast rule. Some people get a sponsorship job at Hohenfels (often seen at places like the school and health clinic) and they make good money and are in qualified positions. But I’ve also seen far too many spouses come in with hopes of subbing at the school in order to get their foot into the door to a teaching position or a nurse be told that if they volunteer for so many hours a week for so many months that they could get in…only to be doing it for 2 years and no job offers. So, my biggest piece of advice on jobs at Hohenfels is to come in with a strong determination, but realistic expectations. Spend some time trying to find if there would be a good fit for you, but don’t wear or stress yourself out. If you can afford it for the short time you are stationed here, instead spend your time volunteering at activities that don’t have drama or stress (The Red Cross, schools, different organizations like the HCSC (Hohenfels Community and Spouses Club), churches and more). Spend your time traveling instead of trying to impress a boss that isn’t even yours yet. You have all the time in the world to work when you return back the States, but you only have a few short years to fully experience Germany. Some people don’t have the luxury of not working though, so while there are still many other opportunities, a few places that are typically always looking for workers are: Subs at the schools, Burger King/ Subway, Child Services. Again, stop into any of them, look at USAJobs and see what the ACS (Army Community Service) building can help you out with. To and From Post: There are Post shuttles that go to several of the main off-post towns. Due to OPSEC, times and locations are not posted online. In general, there are a mid-morning (9amish), Noon(ish) and evening (5pmish) stops pending exact locations. The shuttles run to various neighborhoods and then drop you off by the PX on Post. Once you know where you will be living, just ask around for the location of the stop, go to it and look at the timetables. Trains: If you want to head to nearby places like Regensburg, Nurnberg and elsewhere, the two nearest train stations are Parsberg and Beratzhausen. EconomicalExcursionists Posts: Don’t forget to check out our other posts on your first glances into what to expect being stationed in Hohenfels as well as overall things to prepare yourself for life in Germany. 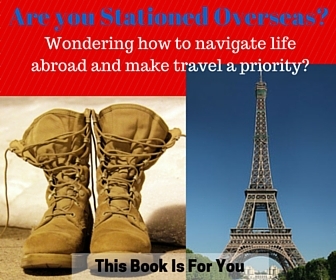 “So You Got Stationed Overseas: Why you NEED to make TRAVEL a part of your short PCS abroad”: Our official E-book for helping you transition to your new home in Germany and help you figure out how to affordably travel despite excuses, money, weather, bad schedules and more. MilitaryInstallations.dod.mil: This goldmine of a site offers basic information on anything from in processing to housing. EconomicalExcursionists: Give us a “Like” in order to get great travel tips, inspiration and advice on Germany and Europe. Official Garrison Facebook Page: Get updates on anything from what is going on both on and off Post as well as other current updates like weather advisories. Official Hohenfels MWR Page: Looking to get fit, social, go on a trip and more? MWR is the place to find out what fun activities are being planning on Post. Hohenfels Military Spouses: The admins do a beautiful job of keeping gossip, rumors and negativity away from this page. Instead, it is the perfect resource when looking for advice on local customs, not sure the best place to shop or look for something on the economy, curious about something on or off Post and is a great place to find fellow spouses. Army Wife Travelers (Bavaria) Army Wife Travelers: Since I KNOW that travel is on your top things to do while in Europe, this page is the ultimate in getting tips, asking for advice and finding inspiration on things to do both near and far from Hohenfels. Buy and Sell Pages: There are a few buy and sell pages, but one of the main ones are the Kwik Klassifieds and Take My Stuff. Perfect for finding 220v and other items to get for cheap as you settle in or to get rid of before your PCS back home. Ramstein Passenger Terminal: If you are interested in flying Space A back to the US at all, this is the page to be checking out. Phew….I’ll let you take a moment to take all of that in!!! Still have a question about moving to Hohenfels? I’d love to help ease your mind and welcome you to the community! Drop me a line in the comments and I’ll be sure to help you figure out your way. Looking forward to having you here! Have you lived in Hohenfels? What did I miss that could help a newcomer find his/her way and get excited about their move and PCS to beautiful Bavaria?